To celebrate the upcoming headlining performance at the 2015 edition of The San Diego Blues Festival by Booker T Jones, I thought it would be fun to revisit the 1962 album Green Onions. That album established a career path for the wunderkind from Memphis and had a profound impact on rhythm & blues and other forms of popular music. The instrumental band, Booker T & the M.G.s, featured Jones on organ who at the time was a seventeen year old prodigy. The album and the immediate success of the band is a wonderful combination of serendipity, good timing, a lot of talent and great chemistry. Green Onions was the band’s debut album and the first long playing record to be released on the new “Stax” imprint. The album features the now iconic organ playing of Jones, but also represents the label debut of an already established Memphis drummer Al Jackson Jr. The 27 year old Jackson had been a drummer since he was a child, as he was playing in his father’s jazz band at the age of five. He was playing with the popular Willie Mitchell Band in Memphis when he signed on at Stax. He was about to become one of the most influential and instantly recognizable drummers in recorded music history. However, at the time Al Jackson Jr. was just the best drummer in town. He was in such demand that it has been widely reported that Jackson was one of the very first “side men” at Stax to receive a weekly salary when he walked into the Stax studio in 1962. Bassist Lewie Steinberg who was 29 in 1962 was the senior member of the ensemble. He had played with Jackson in Willie Mitchell’s band. The band’s guitarist was 20 year old Steve Cropper. He would soon go on to be the label’s A&R man, as well as a valuable producer and songwriter for Stax. He had already had an impact on the record company as a member of the Mar-Keys and their 1961 instrumental hit single Last Night. The label was founded in 1957 by Jim Stewart and was initially called Satellite records. A year later his sister Estelle Axton bought into the company and would remain an invaluable part of the artistic and financial success of the operation. Their first single was on popular disc jockey Rufus Thomas who had been a tap dancer and vaudeville entertainer since the 1930’s. In 1961 they changed the name to Stax which was a combination of the sibling’s two last names. By this time they had already moved into what would be their permanent home, the old Capitol Theater on 926 East McClemore Avenue in East Memphis. The space was divided in half. One portion of the interior space was used as the recording studio. The other part of the building was at one time the lobby and concession stand. That area was converted to an area to sell ear candy. Estelle Axton kept a close track of what people were buying and thought it made sense to have her brother record music that sounded like that. Rhythm & Blues was popular in the neighborhood and that is what Jim Stewart and Estelle Axton set out to produce in thei r studio and to sell out of their Satellite Records store. Steve Cropper had been a clerk at the Satellite Record Store and it was there he met Booker T Jones who was a regular at the shop. In the summer of 1962 four of Stax’ session musicians, Cropper, Steinberg, Jackson and Jones, were hanging around the Stax studio with some down time while working with a singer previously associated with Memphis’ Sun label, Billy Lee Riley. They did what most musicians do, or at least did in those days, and that is warm up to a blues. Jackson, Steinberg and Cropper gathered around a smoldering slow blues being cooked up on the Hammond M3 organ being played by the multi-instrumentalist Jones. Stewart rolled tape and the song that became known as Behave Yourself was recorded. With a few minutes left to kill, the band launched into another impromptu blues jam. The song was centered around a relentlessly dangerous organ riff that Jones had come up with. The song featured equally menacing rhythmic guitar lines and a mid-song solo which was a template of toughness. The 12 bar blues had no name, but due to the funky nature of the number the band agreed upon the funkiest, nastiest thing that popped into their heads, which at that moment happened to be, green onions. Stewart initially pressed the record with Behave Yourself as the “A” side and Green Onions as the “B” side. 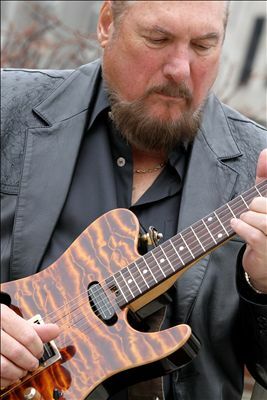 Steve Cropper has told the story of taking the record to radio station WLOK, where the DJ listened to only half of Behave Yourself “off the air” before flipping the record over and putting Green Onions “on the air.” He then played the song four or five straight times with everybody dancing around the control room. The phones rang off the hook at the station. Memphis fell in love with a 12 bar blues instrumental and with a band that didn’t even have a name yet and technically didn’t really even exist. Stewart immediately repressed the record with Green Onions as the “A” side. The 45 was initially released on the label’s Volt imprint, but was put out on the Stax label so as to increase the profile and name recognition of the brand new company. The band quickly came up with a name. The “MGs” of Booker T & the MGs had for years been reported to stand for “Memphis Group.” While that would be entirely appropriate and very cool, it simply is not the case. It was in fact named after the little sports car driven by Stax producer Chips Moman who produced records made by a group that had also named themselves after a sporty little two seat convertible, The Triumphs. Now an album was recorded around these two songs. The Green Onions album is a bare bones musical journey that is simply a stunning achievement in perfection, timing, nuance and musical empathy. The entire band sounded like they had been playing together for years. The musical maturity of the twenty year old Cropper and seventeen year old Jones is, in retrospect, nothing short of astonishing. MGs’ take on Ray Charles’ I Got a Woman and Doc Pomus’ Lonely Avenue (famously recorded by Charles). There is a stunning version of Mel Torme’s Comin’ Home Baby as well as a sequel to Green Onions entitled Mo’ Onions which stands all on its own. The entire album was a beacon of cool in the early 60’s pabulum era of pop music. The sound of Booker T & the MGs would come to define what is known as Southern soul music. The MGs groove would infect the songs of everyone who recorded on the Stax/Volt label. The record company’s house bassist Donald "Duck" Dunn would be on most of these tracks and was a natural fit to be a permanent member of the band. The MGs also backed up Atlantic artists who were sent there to record at the former movie theater in Memphis. Famous singers like Wilson Pickett, Eddie Floyd, Sam & Dave, Rufus Thomas, his daughter Carla Thomas, Johnny Taylor, Mable John, Don Covey and others had hit tunes with the MGs’ magic all over the records. The most famous and beloved soul singer on the label was Otis Redding and his tunes, in particular, reek of the MGs’ bluesy funk. The title track to blues man Albert King’s album Born Under a Bad Sign was written by Booker T Jones and that iconic blues album, like all his Stax output from the 60’s, had the MGs as the core band. 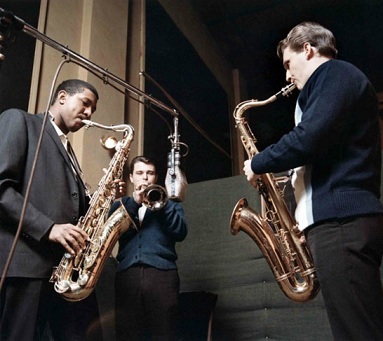 The MGs were augmented on various sessions for Stax artists by keyboard player Issac Hayes along with horn players that include, most notably, Gene “Bowlegs” Miller and Wayne Jackson on trumpet, Floyd Newman on baritone sax along with tenor sax men Joe Arnold and Andrew Love. They released numerous singles throughout the 60’s. MGs’ originals like Hip Hug Her, Soul Limbo and Time is Tight, in particular, had some chart success as did covers like the band’s take on the Rascal’s hit Groovin’ and their version of the theme to the movie Hang ‘Em High. The band’s final and second biggest chart success came by way of the song Time Is Tight which along with Green Onions became as closely associated with the band as any other tune in their canon. The band recorded ten more full length albums under the name Booker T & the MGs at Stax until they left the label in 1970. In the 70’s, Al Jackson Jr. re-united with band leader Willie Mitchell, who was now producing records for his own Hi Records Label and running the Royal Studios, which was waxing soul records for various artists including O.V. Wright, Ann Peebles, Syl Johnson and others including the label’s biggest act, Al Green. Jackson’s distinctive drumming added a danceable groove and added that Southern soul grit to many of Green’s biggest hits and most memorable sides. He also co-wrote some of Green’s most enduring songs including his signature classic, Let’s Stay Together. In 1975, the great Al Jackson Jr. was shot down in cold blood, execution style, in his own home. Bassist Lewie Steinberg played on every track on Green Onions as well as the band’s follow-up album Soul Dressing and then yielded the bass chores to Steve Cropper’s old friend Donald “Duck” Dunn. Steinberg slipped quietly into obscurity while Dunn appeared on numerous hit recordings with a variety of high profile artists in various fields of music. The big Fender bass of Donald “Duck” Dunn can be heard on recordings from Muddy Waters to Neil Young, from Freddy King to Rod Stewart and from Albert King to Elvis Presley. Donald “Duck” Dunn died on May 13, 2012, at the age of 70. He was on tour in Japan with Steve Cropper when he died in his sleep. The 82 year old Steinberg is still living in Memphis. 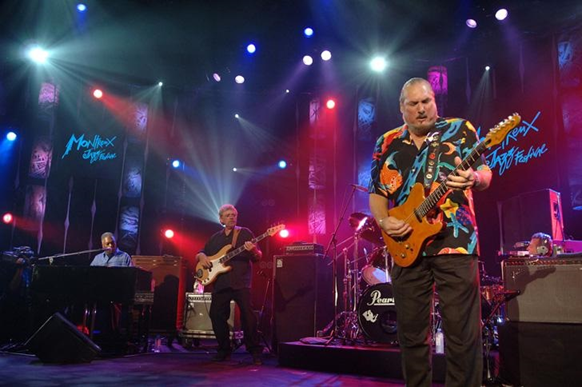 Like his old friend Dunn, Steve Cropper has been a ubiquitous presence in American music. From as early as high school with his band the Royal Spades which morphed into The Mar-Keys, Cropper has been a mover and a shaker. Also like Dunn, Cropper became known to mainstream audiences via his long association with The Blues Brothers franchise. To even attempt to run down even a short list of recording credits, awards, accommodations and special live performances on Cropper would take all day. As for the wunderkind Booker T Jones, he left Stax Records and Memphis for California and never looked back. He has assumed a much lower profile than both Cropper and Dunn yet in his own quiet way forged a successful solo career. Early post Stax highlights include a successful collaboration with Bill Withers and Willie Nelson. Withers’ Just As I Am and Nelson’s Stardust were produced by Jones who played on both LPs. These albums were huge artistic and financial success stories that launched one career and turned an outlaw country performer into a huge mainstream cross over artist. As a collective, Booker T the MGs reunited for an album after the death of Al Jackson Jr. Their 1977 record entitled Universal Language was a critical success, but it sold poorly. Sixteen years later the band reunited with Jackson’s nephew Steve Potter on drums. They played a few high profile gigs and released an excellent album on Columbia entitled That’s The Way It Should Be. The band actually got out and toured off and on for a few years. In 2003, fifty new songs cut by Booker T & the MGs in the mid 60’s were unearthed and released on two separate albums. None of these tracks were previously available in any form and represented a treasure trove for any MG fan. The album Soul Men is all MG covers. The album Stax Instrumentals features the band doing all MG originals. On some of these tracks the MGs are accompanied by horns via some iteration of the Mar-Keys. These are all fully realized songs that for some inexplicable reason didn’t make it on any of the band’s eleven albums. The material on these two albums can stand side by side with some of their best work. They are that good. As for Booker T & the MGs’ irresistible title track to their first album Green Onions, it topped out at number three on the pop charts and reached number one on the r&b charts. That was just the beginning. These two minutes and fifty five seconds of blues has never stopped being exhilarating to anyone who hears the tune. At this point that is just about everyone. 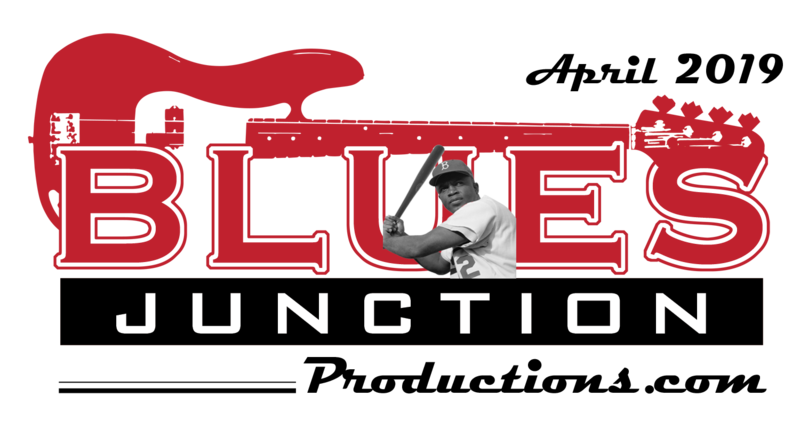 Generations of people have heard the tune as it is introduced to newer generations in numerous movie soundtracks, television commercials and between innings at Baseball games. It is one of five ring back tones on my phone and the only one everyone recognizes. As far as the Stax label is concerned it’s a wonderful story of a ma and pa style operation which really was run by an aunt and uncle. The innocence of that time soon gave way to the big ambitions, the big ideas, the big dreams and the big mouth of Al Bell. The label lost its biggest and brightest star, Otis Redding and his road band in a small plane crash on December 10, 1967. Just four months later the world lost Dr. Martin Luther King who was gunned down in Memphis. 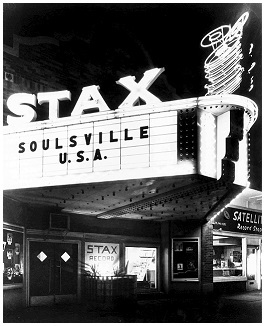 America and especially Memphis and therefore Stax Records would never be the same. The down home, neighborhood, family type atmosphere that had developed organically at the label was now a thing of the past. The label lost its soul when Booker T & the MGs left in 1970. Yet, Stax soared to great heights in the 1970’s. The label branched out into movies, comedy albums and at one time put out as many as 27 albums a year. It soared briefly to the top of the entertainment industry and then crashed under the weight of its own excesses. 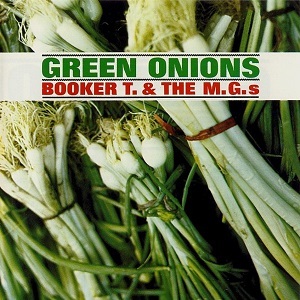 Green Onions and Booker T & the MGs became a hit against great odds. The racially integrated band couldn’t even play live in their home town or anywhere else in the South in the 1960’s. They had hit singles and made album after album without singing one single note. By 1962, the instrumental era was coming to a close as it was the voices that meant everything. It was the era between the great doo wop groups and singer/songwriters. This was in a time and place where everyone was trying to sound like either the Beach Boys or the Beatles or Bob Dylan or the Birds and all four were trying to sound like one another. Nobody sounded like the MGs. Sometime today I just might listen to the song Green Onions. I will smile, bob my head and tap my foot to the opening hi-hat groove being laid down by Al Jackson Jr. which morphs straight into the relentless backbeat that carries the tune along through its final fade which I always hope can go on forever. I will smile when half way through Steve Cropper’s solo he dumps reverb all over the joint. I will listen to the riff being laid down by Booker T Jones. I will also think how fortunate I am to get through this entire essay and not whip out that tired old cliché and call the song Green Onions and the album of the same name a “timeless classic.” After all it is a cool blues tune and “timeless classic” is just something that comes with the territory. 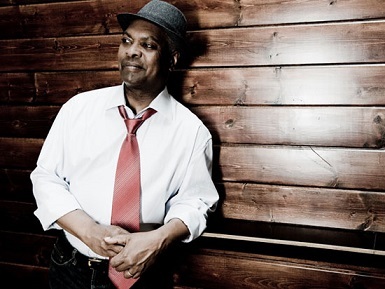 Booker T Jones set will begin at 6:30pm on the Bay Stage at the San Diego Blues Festival on September 27, 2015.